Happy Monday, friends! We had such a busy weekend that it didn't even really feel like a weekend. A baseball game, sleepovers, football/cheer, another baseball game, two birthday parties, a trip to the pumpkin patch, a soccer game, another birthday party, and all-star cheer practice. Basically I shuttled kids around all.weekend.long. I need a weekend just to recover from my weekend. Times like this when I'm not home to cook we will usually just run through the drive through or order pizza, but we've been doing that a lot and I really have been making an effort to plan ahead for our meals. 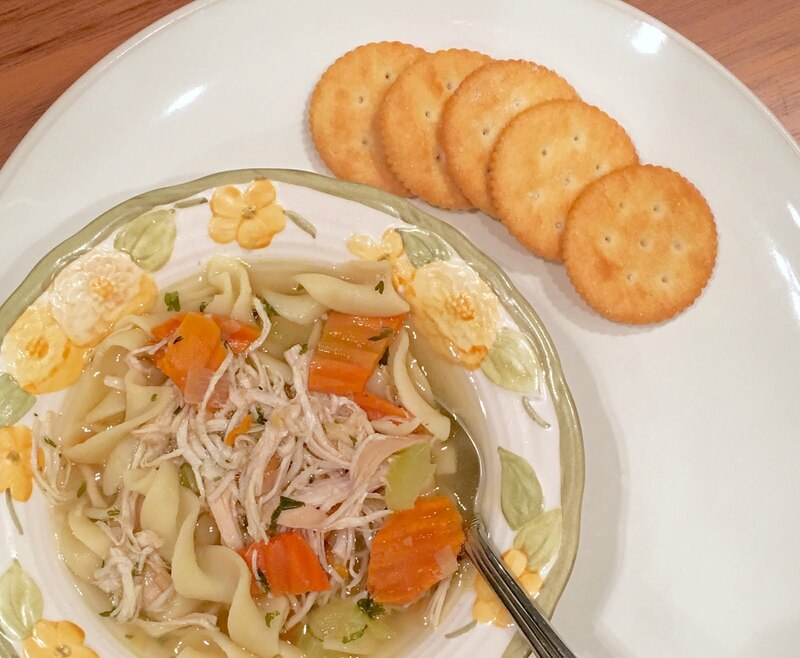 Last week our friend, Amanda, from Dixie Delights shared a crock-pot chicken noodle soup on her Instagram Story. Back to the recipe. She had shared it on her blog, HERE, so I printed off the recipe and got to work. The first, and most involved step was getting all of the ingredients. For most it might not be hard, but remember that I like to keep things simple around here and I had to google what a leek was. In my defense, I had heard of a leek before, but had never cooked with one and I needed to know what to be looking for at the grocery store. Being the best friend she is, Jen made me feel better about my lack of knowledge about leeks. After I was armed with my leek knowledge and had I gathered all my ingredients, I was ready to pull out the old crock-pot. Saturday morning before we had to leave for all of the game and parties and actives, I chopped and prepared and dumped in all of the ingredients. 7 hours later I returned home to a delicious and hearty meal! It was finally feeling like fall outside and we had spent most of the day outdoors, so this was the perfect meal to come home to. We had pumpkins on our porch, we had football on the TV, and we had soup to warm us up! -I used boneless chicken breasts instead of bone-in chicken. -I used pre-sliced carrots from the produce department. -I also used jarred/ground spices and herbs instead of the fresh sprigs and leaves it called for, because it is what I had in my kitchen and, let's face it...I didn't even know what a leek was. 1. Place chicken and next 11 ingredients in a 6-qt. slow cooker. Cover and cook on LOW 6 hours or until chicken and vegetables are tender and chicken separates from bone. 2. Remove chicken from slow cooker. Dice meat, discarding bones. Return meat to slow cooker. Stir in uncooked noodles and parsley. Cover and cook on HIGH 15 to 20 minutes or until noodles are tender. Stir in lemon juice. Serve immediately, and garnish with any leftover chopped fresh parsley. I definitely recommend making this soup! It was so yummy. We had enough for leftovers and I also ended up freezing some to be able to pull out and warm up another time. Such an easy meal and perfect for the fall!